If Washington doesn’t overcome its divided and dysfunctional nature by Friday, the Department of Homeland Security will fall into a partial shutdown. This shutdown would represent a truly shameful and embarrassing triumph of partisan politics over good governance and the idea that some things should be above politics (ex. national security). 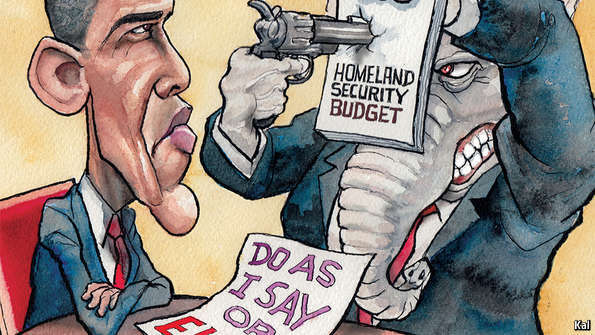 A partial shutdown of DHS would cause thousands of vital American security personnel (ex. border patrol agents, TSA screeners, etc.) to be forced to work without pay. These personnel would be eligible for back-pay at the conclusion of the shutdown, but that would require approval by the legislature and would do nothing to help them pay their rent and food bills during the duration of the crisis. Non-vital personnel at DHS agencies would be sent home without pay while non-vital functions of those agencies (ex. FEMA disaster preparedness trainings for cities) will stop until the budget situation is resolved. Such non-vital DHS functions include millions in state grants, thus any shutdown promises to have widespread economic consequences, not only within the federal workforce, but also through state governments and private contractors that perform DHS projects. The impending shutdown of DHS is being driven solely by a political stunt by the Republican Party—both parties acknowledge that funding DHS is necessary, but the Republicans are attempting to use this necessity to bootstrap anti-immigration legislation past a presidential veto. All spending bills must originate in the Republican-controlled House of Representatives, and the Republicans have chosen to amend the DHS budget to block Obama’s executive actions on immigration. Because of this poison pill, the Senate Democrats have filibustered the House DHS budget, leaving funding in limbo. The Republicans won’t pass a clean DHS funding bill and the Democrats lack any real leverage to remedy the situation. In effect, the GOP is holding the organization that coordinates our nation’s security agencies hostage in an attempt to force Obama to reverse his attempts to be merciful to undocumented immigrants who pose no threat to our nation. The Republicans know that they cannot get anything past a presidential veto alone, so they have attached their anti-immigrant legislation to a bill that simply must pass. This tactic has been effective in the past (ex. when they tied extensions for the Bush tax cuts to continuing unemployment benefits for the poor), but the idea that national security is fair game for its application is a new phenomenon. The Republicans court very real harm to our nation and are doing so merely to score political points. While vital security services would continue, things could easily slip through the cracks during a prolonged shutdown, leading to a disaster—this potential disaster isn’t limited to terrorism, as DHS has wide-ranging legal and disaster management roles. If DHS is shut down, the Republicans hope that Obama and the Democrats will be blamed by the American people, regardless of the facts. They are likely preparing to go on a massive media offensive on the day of the shutdown, accusing Obama of compromising national security, while relying upon the media’s tendency to report “both sides of the story” without fact checking either to see if they are true. Unfortunately, I have little faith in the media or the American public’s ability to parse reporting on political issues to determine what is true, so I fear that this GOP victory is actually very possible. Ideally, from the GOP perspective, they would precipitate this crisis, compel Obama to capitulate on immigration, then score a big PR win against the administration that they could use in 2016 to accuse the Democrats of being “soft on defense.” This would be a PR and policy hat-trick for them that would likely set the stage for further hostage crises. Put simply, Obama and the Democrats must draw a line in the sand in this situation. 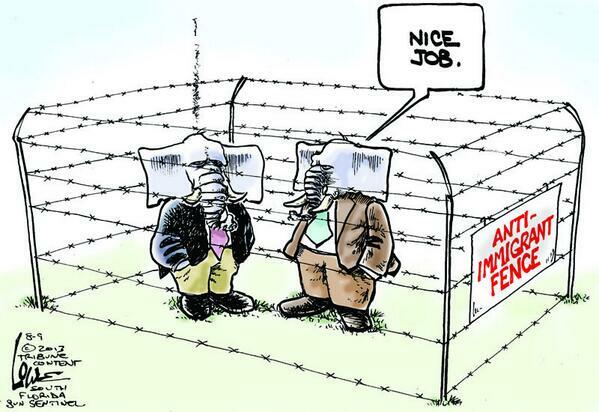 They must hold firm and absolutely excoriate the Republicans in the media if they dare to defund DHS over politics. I think the GOP has once again overplayed their limited hand. Watching them try to “govern” is like watching and copy of the “Our Gang” comedies. The ones where the kids run around in makeshift cars followed by the cops. Funny. Embarrassing. GOP all the way. What really is their end game? They knew it was idiotic and would rile colleagues in the Senate before it ever got passed in the House. Is their only strategy for the next two years to continue batting their heads against the walls of reason? Reblogging on the New NY 23rd, with thanks. They don’t have a defined end-game other than to destroy anything that Obama does in the short-term. If Obama supports it, they will oppose it and will use anything they can think of to achieve their ends, regardless of the long-term damage. In short, they are imbeciles with guns in a house of mirrors. The GOP has been given the opportunity they demanded, the opportunity to govern. You know what the say, be careful what you wish for. The unfortunate outcome? Those who believe the conservative standard will continue to do so despite their behavior, despite their outcomes, despite the destruction left in their path, ho hell let’s just say it; despite facts.